You need to start collecting data and tracking your success right from the start. It’s going to be impossible to benchmark your success and track growth if you don’t. 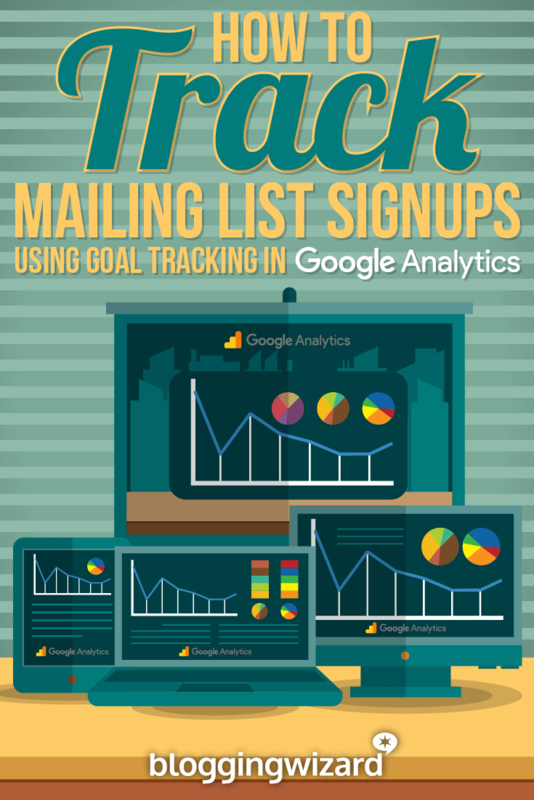 In this post I am going to give you a step by step tutorial on how to track your mailing list sign ups more effectively by using goal tracking within Google Analytics. There will be screenshots too so you know exactly what you are doing. Note: this tutorial is based on using double confirmed opt-ins (this means people enter their email address and have to click on a confirmation link in an email) and while you could still use it for single confirmed opt-ins, I recommend that you stick to using double confirmed opt-ins. Before you can get started with this tutorial you will need to make sure that you have Google Analytics (GA) installed and setup on your website. Getting GA setup is fairly straight forward and shouldn’t take too long to implement. You can find a detailed help section here . It involves signing up for an account, obtaining tracking code and inserting it onto all of the pages on your blog. For those of you that are WordPress users there are plenty of plugins including Google Analyticator that will add the tracking code to all of your pages. Your theme may even have the option itself, then there won’t be any need for a plugin, but I do suggest you check the help section I mentioned previously if you need help getting GA setup. You will benefit from having some sort of auto responder sequence setup, that’s if you haven’t already. To do that you will need some sort of mailing list provider, AWeber and GetResponse are widely accepted as some of the best tools for the job. 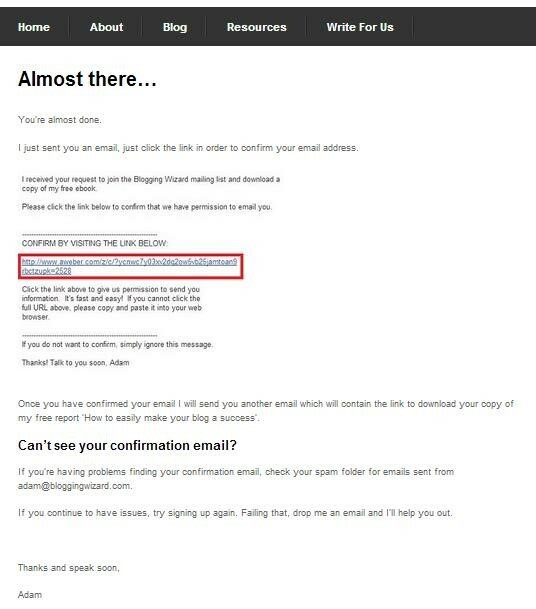 Note that MailChimp does offer a free service but last time I checked this didn’t include access to an auto responder. I could probably squeeze a few more emails in there and I have later on but I like to give some time for subscribers to get through the PDF download that they get for free when signing up to my list. There are a few pages that you will need to set up on your blog that mailing list providers don’t usually talk about all too much because you don’t necessarily need them to make the system work. I find that they do help – A LOT. The idea behind this page is to remind subscriber to click the link in their confirmation email and that they need to do this in order to get access to whatever you are offering as your opt-in incentive. You shouldn’t allow access to your opt-in incentive at this stage because a significant amount of your subscribers will just download it and not bother with clicking the confirmation link. 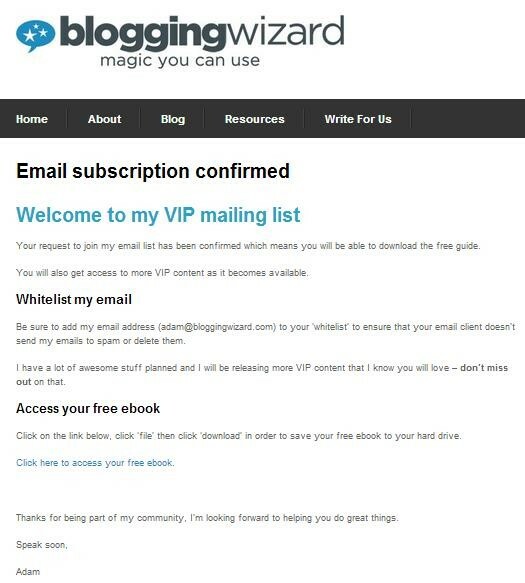 The confirmation page is where your subscribers will be direct to once they click the link in your confirmation email. It’s at this point where you should give your subscribers access to whatever it is that you have promised them – that’s if you have. There are plenty of things that you could include here but I find that the best way to construct this page is to make it as minimal as possible. You want your subscribers to be invested in reading your content. By giving your free download on the confirmation page you offer an added incentive for people to confirm their subscription. If you don’t do this, or you just give access to the free download prior to this you will just lose potential subscribers. Google Analytics allows you to track particular conversion goals very easily, but there is a little bit of setup work involved. You can choose to use a single goal with the funnels option enabled but I like the idea of being able to clearly see the drop off between the thank you page and the subscription confirmed page next to key traffic metrics without any messing around. That’s why I setup two separate goals. One for my thank you page and one for my confirmation page. That’s just my personal preference but I will include how to setup goal tracking like this and I will include how you can setup a single goal with the funnel option enabled. If that’s what you prefer. The majority of the process is very similar. If you sell products or services from your blog then you should definitely take a look at setting up goals with funnels. There is definitely a lot you can do with them such as monitoring checkout pages and basket/cart abandonment for example. Login to your GA account and select the profile for your blog. Click the ‘admin’ button in the right hand corner of your screen. Click on the ‘Goals’ option in the right hand column. Click on the ‘create a goal’ button. 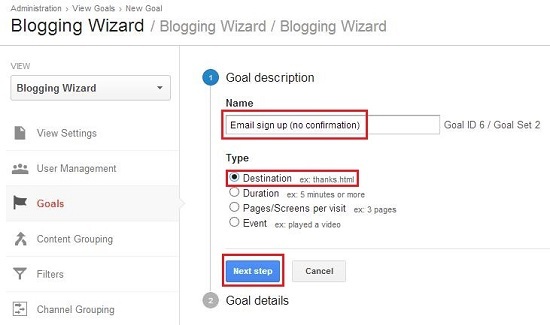 Add a name for your conversion goal and select ‘destination’ then click ‘next step’. Note: this conversion goal will be for your initial thank you page before users have confirmed their subscription. This will allow you to get a more complete set of data. Under ‘destination’ click the drop down menu and select ‘Begins with’ then add the URL for your thank you page (be sure to include the forward slash at the beginning but omit your domain name). Note: if you do want to use funnels here you should turn on the funnel option in the goal where your destination is the confirmation page. Then add the URL of the thank you page under where it says ‘Funnel’. This will then allow you to use the funnel visualisation section within Google Analytics. Click on the ‘goals’ tab on the left hand side to go back to step 4 to repeat this process, this time for your confirmation page. In order for goal tracking to be as accurate as possible you need to take steps to ensure that nobody can find their way to your thank you pages and confirmation pages. If they do, then that will render all of your data meaningless. There are two things that you need to do and the 1st is to set those pages to be no-indexed & no-followed by search engines. This will stop search engines from crawling and indexing the page. 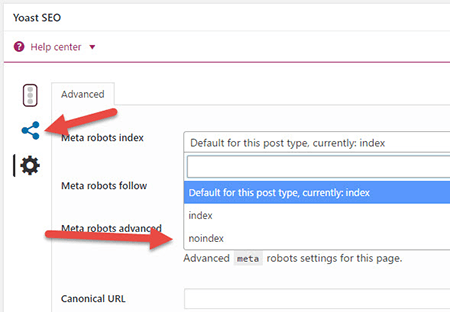 If you’re using WordPress, this is extremely easy to do with all of the major SEO plugins like Yoast and All-In-One SEO (note: check out our post on the best WordPress SEO plugins for more). The second step is to block the page from appearing in your sites internal search engine. How easy or difficult this is to do will completely depend on the platform your blog is built on. 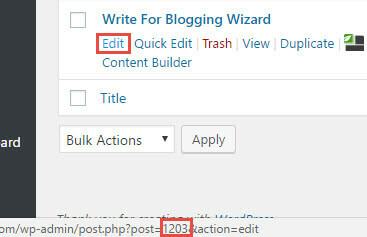 If you are a WordPress.org (the self-hosted version) then you can install a plugin to take care of this for you. I use Search Everything. Once you have installed the plugin you will need to figure out the ‘page ID’ of the pages you wish to exclude from your sites internal search. Now you can go into the plugin settings and add the ID’s of the pages you wish to block from your sites internal search. Note: the numbers are just an example and should be replaced by the ID numbers of your pages. 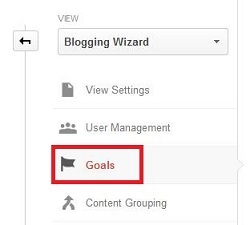 Congratulations – you are now tracking goal conversions in Google Analytics. You will now be able to start collecting goal data. As the data comes in you will be able to go into Google Analytics and check out the acquisition (traffic sources) and audience sections to get a better understanding of your subscribers and which traffic sources yields the most subscribers. Now that you have set up these goals you may want to experiment and explore the other data points that you can use for goal tracking in Google Analytics.